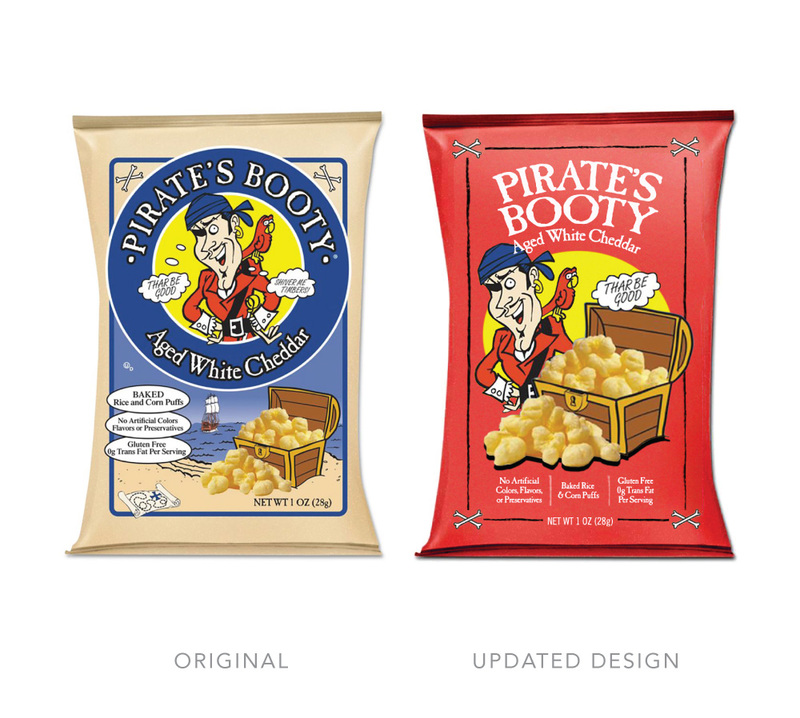 In our world, we typically do a full strategic discovery to drive a rebrand, however I thought it might be fun to do a creative exercise and whip out some super fast designs on existing packages that I thought I could modernize. I’m calling this “Rebrand – with the Same Brand.” The idea is to try and quickly figure out how to take the existing brand’s bones and equity, and then reconfigure, recolor, & ‘re-love’ them to a bold and fresh design. I loved the simple triangle pattern on the edges and wanted to play that up more as a larger repeating pattern. I also thought the logo felt like it could go toward a more graphic and iconic style – less ‘airbrushy’. A more limited color palette might also make this feel more modern. 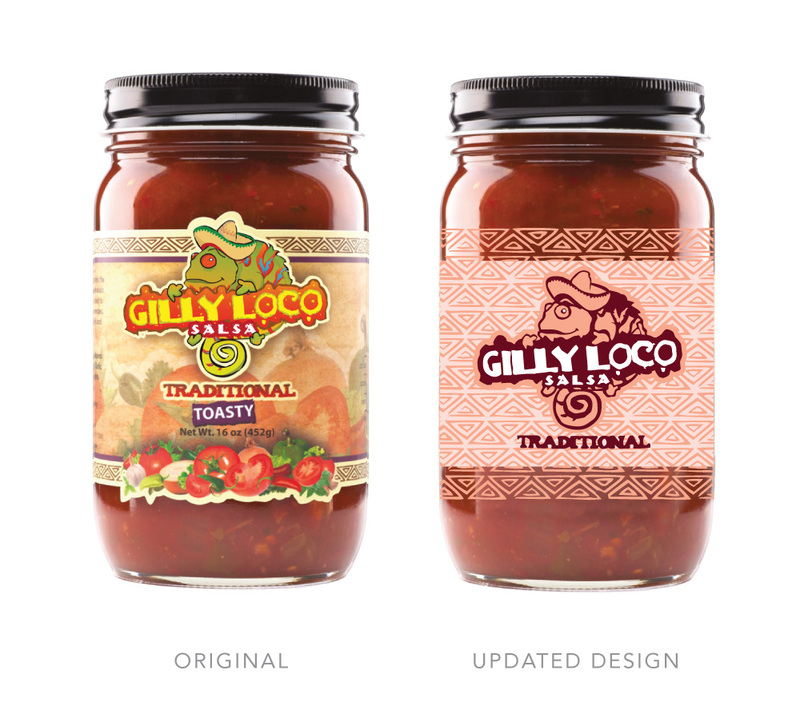 Silk screening the label would allow for the salsa to partially show through the pattern in a beautiful way, and would give the overall appearance of a higher-end product. They could also achieve a similar look with a clear label. But I do always prefer the direct-to-glass silk screen. My approach here would be to print a custom foil bag with a fun and bold supergraphic of their logo’s symbol in the background. You could keep the metallic look, or even consider a matte or craft finish using dark chocolate & copper colors. This could be the same bag used for all their coffees. 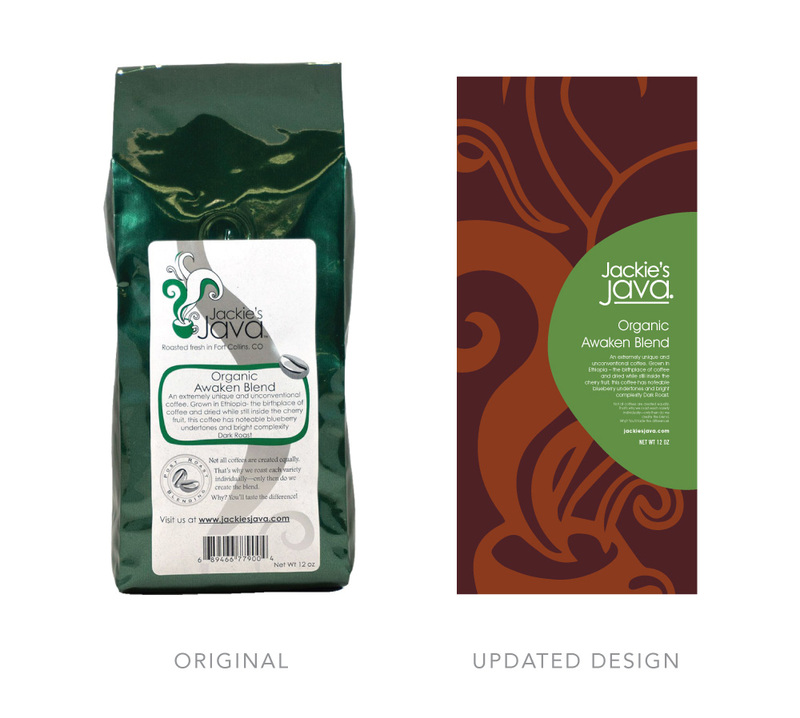 But what could differentiate the coffees would be a self-adhesive, custom die cut label that wraps around the front & right side corner – as seen with the imperfect green circle. A variety of bold colors for different flavors would contrast nicely against the dark background of the bag. A simplified logo (without the coffee symbol) seems to elevate the premium-ness of the product. Now I’m feeling ready for my third cup of coffee today! After doing a little bit of research I decided to switch to a simpler bottle shape at that same volume, which would give them a different label shape to work with. This new solution uses a simplified version of the illustration with warmer and more appetizing colors that compliment the product’s color. 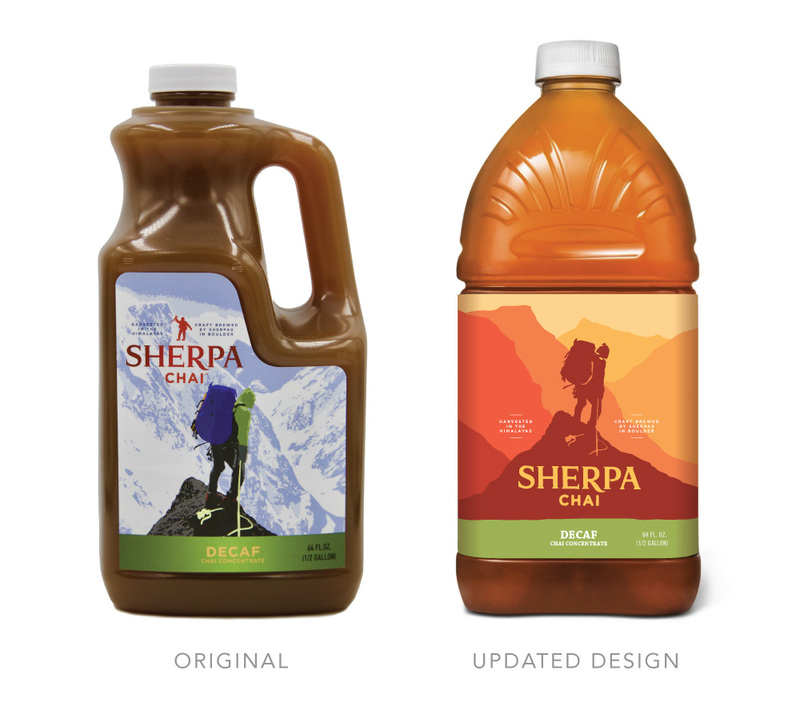 The logo’s small sherpa icon has been removed so that the primary illustration can act as a cleaner lead-in to the logotype. And the logo can now be a larger and more centralized element on the label. I absolutely love seeing pickled veggies in jars. There’s something so beautiful about how they look. And seeing more of them feels ultra appetizing on shelf. I I decided to forgo the label and do a simple 2-3 color silk screen directly on the glass container. In my version, there’s no need for a cowboy photo. But I’m keeping a subtle cowboy reference with the simple hat icon. 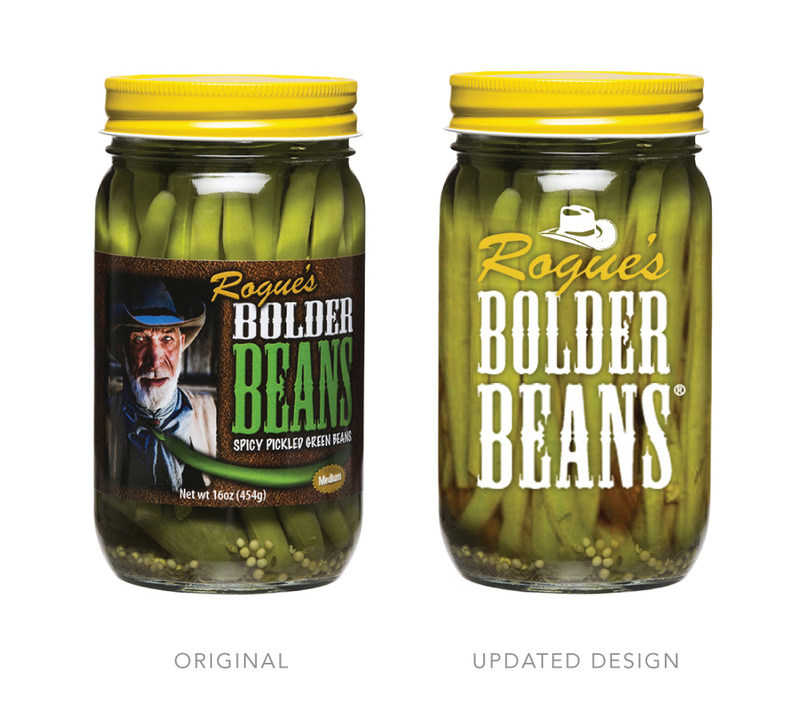 And now the company’s name and product type looks a lot ‘bolder’ when screened this large on the jar (no pun intended). Those beans look killer. Nom, nom, nom, nom….. This has always been a staple in my house. My kids love PB! And I can easily kill a bag anytime. This packaging cracks me up every time I grab it off the shelf. The campiness of the illustration is awesome. I think switching to more of a solid red bag would add more shelf attention. And I always like to clearly see the product I’m buying. So making the cheese puffs much larger helps a lot. I think there’s enough pirate references to where you could deprioritize some of the other illustration details like the ocean, beach, boat, etc… The pirate character and treasure chest say enough. Less be more, matey. Kevin Bonner Kevin brings more than 15 years of experience in both brand development and design execution. He joined Vermilion in 2006, after honing his craft in San Francisco working for clients including SanDisk, Yonex, the San Francisco Giants and UbiSoft. At Vermilion, Kevin has designed for clients across all verticals, including Whole Foods Market, IZZE, JC’s, and Via (formerly Special Transit). Kevin recently returned to mountain biking (and promptly injured himself) and he’s teaching himself to play the banjo.